Radiohead are an alternative rock band headed by Thom Yorke that was primarily popular in the 90's with their famous albums OK Computer and The Bends, and songs such as Creep (Pablo Honey), Just (The Bends), Paranoid Android (OK Computer), Karma Police (OK Computer) and No Surprises (OK Computer). Some critics often cite Muse as Radiohead's sound-alikes, although fans generally consider all similarities vague, if not irritating, and that they were dissolved with the release of Origin of Symmetry. Similarities includes facts such Matt Bellamy & Thom Yorke (Radiohead's singer) had declared being influenced by the singer Jeff Buckley, the progressive rock influences in both band's music, that both bands worked with the acclaimed rock music producer John Leckie & that, as most of the 90's bands, Muse & Radiohead started as post-grunge and alternative rock bands. Muse considers such squalid comparisons to be "lazy journalism." -The band laugh and shrug their shoulders at the suggestion that they sound more than a tiny bit like Radiohead-not least Matthews's vocals aerobics, which bear an uncanny resemblance to the Oxford miserabilists" crooner Thom Yorke. "John Leckie, who produced our debut album and Radiohead's "The Bends" said Thom used to listen to a lot of Jeff Buckley, and so did I. Matthew offers in defence. "There a elements where we've been influenced by a lot of the same things, but not influenced by them, everything will be fine". "Showbiz turned out to be a robust, impressive album full of rock theatrics, a neat line in lyrical doom, and an operatic lead vocal that rivals Freddie Mercury for arch dramatics. Mind you, there is no getting away from the fact that it sounds shockingly similar to both Radiohead and Jeff Buckley, and accusation which dogs Muse wherever they go. Bellamy rolls his eyes and says he'd "rather not comment on that". After much pestering he gives in, but will only refer to Radiohead as "that band". What are your 5 favourite bands of all time? Matt: Primus, Nirvana, Jeff Buckley, Deftones, Rage Against The Machine. Dom : Limp bizkit, Radiohead, Pavement, dEUS, Smashing Pumpkins. Chris: Helmet, Korn, Deftones, The Beach Boys, Nirvana. TC- It sure does, Well who are some of your favorite bands around now? C- Um... Rage Against The Machine, Primus, Nirvana, they're good. With the Nirvana and Radiohead thing, what we were actually talking about in the bio was the fact that they were probably the two most influential bands of the decade for most bands. Not necessarily for us, they were just the two biggest guitar bands around really. We were into Nirvana when we were younger, when we were in previous bands we did covers of their stuff, it was what got us into bands really, it was what made us want to be in bands. 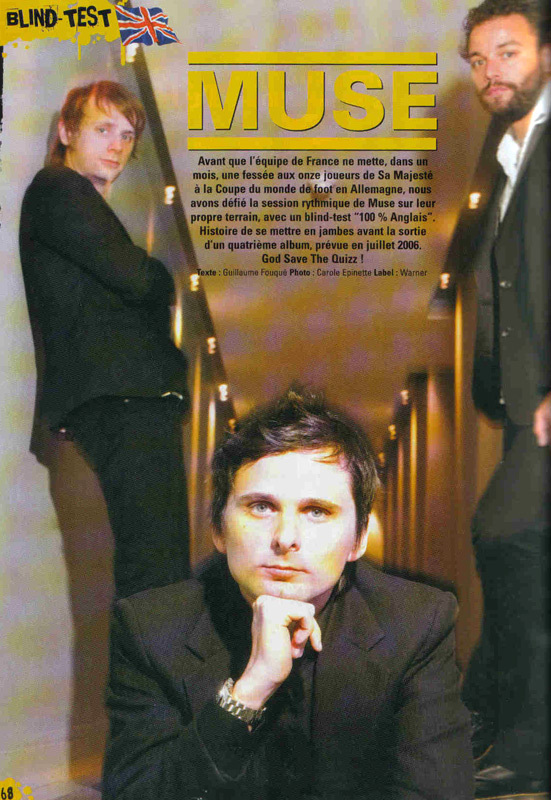 In a band's interview featured in the February 22 1999 issue of NME the interviewer (Mark Beaumont) said various times that Muse is a band that "sounds exactly like Radiohead"
Matt Bellamy responded with this: "We don't want to get pigeonholed so easily." "it's too easy to say you sounds like this, you sound like that," says Chris "People don't listen to the stuff enough to make up their own mind about it." "we take our influences from lots of American bands, like Nirvana, Matthew asserts. And, yeah, Radiohead at the time of 'The Bends' were doing new things with guitar music that it's hard not to be influenced by. If that's your opinion, then fair enough, i just don't care." What were Muse's influences when you formed? Dom "It started off with Primus, bit of Nirvana, early English bands like Senseless Things and Mega City Four..."
Matt "...this is when we were 13 and 14. Around that time it was all 'Fraggle Rock' type music Wedding Present, early bits of Sonic Youth were coming through. That was the stuff that got us going. I learnt some Spanish guitar music that opened up a world of different harmonies and making music and a different sort of passion, very heavy music but it hasn't got a distortion pedal. Then I got into some blues music and Jimi Hendrix Experience"
Matt (laughs) "I think, in the last 10 years, they are probably one of the best English bands around"
Dom "It's ok. It sounds very much like Aphex Twin to me." Matt "It's Aphex Twin, DJ Shadow. I think they are very concerned with being at the cutting edge of what new music is and people like Aphex Twin, to DJ Shadow and even Moby are doing modern things, mixing techniques with real live music. They are very paranoid of ever being seen as just an old guitar rock band...which I can understand." 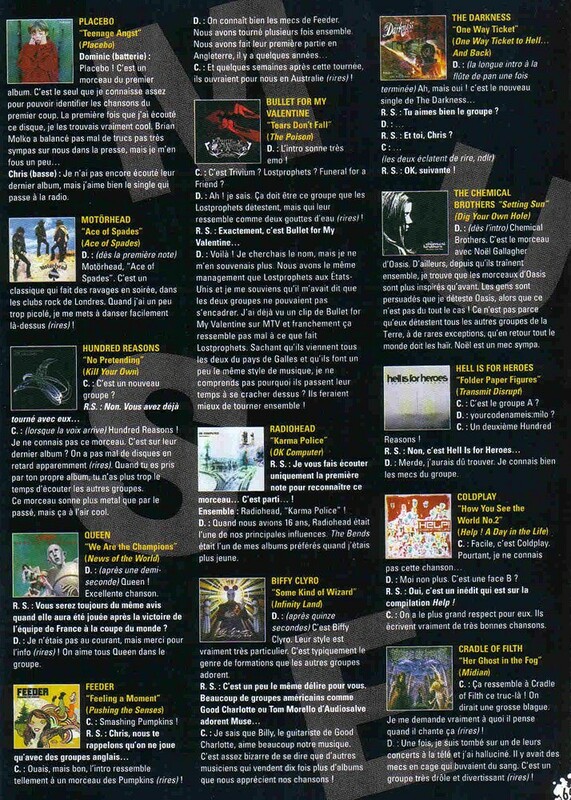 In a 2006 issue of Rock Sound Magazine Dominic Howard named Radiohead as one of the bands major influences. Rock Sound: "You’ll only have the first note to recognize this song ... go!" Dom and Chris together: "Radiohead! Karma Police!" Chris:"Around the time we got into the band we were listening to things like Nirvana, Smashing Pumpkins, Radiohead, Rage Against the Machine you know...all that kind of stuff you know"
The band is amused about people or critics doing comparisons with bands such Radiohead or Coldplay; However bassist Christoper Wolstenholme considers it a way to depict a new concept. “There are miles away between us and Radiohead, but is the same story with all the bands, they'll always do comparisons because is easier for more people understand a new concept when it gets compared with something already known. "I like Muse because they sound like a fiercely modern band. I saw a band who had a sound that could carry us to the year 2000. And of course i can hear the talent on Matt's lyrics & voice. It's funny that people tell me that they sounds like Radiohead,because it never occurred to me. i think that Travis sounds more like Radiohead than they do. In the studio they were very competent. So it was up to me to create the right mood for them to play in. Getting things like the lighting right. Also as an old person. I was able to introduce them to a lot of stuff. I played Tom Waits to Matt. Which he just couldn't understand, and now of course he's trying to sing like him." My first experience of the band was when the original version of "Muscle Museum" came out. It was one of these interesting records that didn't fit into what was around. It immediately got a really good reaction from the listeners. I don't think that they sound that much like Radiohead - They have their fragility and obviously Matt has the same Tom Yorke thing of being an anty-star who still ultimatelly wants to be a popstar. What is really good about them is that they really can play. they're not one of these groups that going to held back just because they can't find that extra chord. Matt Bellamy never had met Radiohead, except of Colin Greenwood (Radiohead´s bass player) & he says that he is "cool." "Matt is very interested in new technological tones: he likes Björk very much, or stills Amnesiac, Radiohead's last album, but he doesn't likes Kid A at all." In 2003 Matt Bellamy said:	"There are two ways of making new music : You can do something totally new and refreshing or you can work on already existing concepts, adding things to it. The first thing is difficult to do, actually that's only possible with making new sounds with computers. The second way is just correcting things. Actually there's also a third option which is doin a little of both, Radiohead's Kid A is a good example of that. That's what we are doing, looking at the past and trying to make progress. Do you feel any pressure to try and sound "less Radiohead"? What do you say to all those people who compare Muse to Radiohead? In an interview with the Italian magazine, Panorama, Matt and Dom were asked about if are there any relation between Muse & Radiohead. This page was last edited on 31 August 2014, at 20:27.